Whether you’re a DIY mechanic, a weekend warrior, or just an everyday garage tinkerer, having a good set of tools is an important step in making your projects run smoothly. To get started with air tools such as impact wrenches, nail guns, and paint sprayers, you’ll need a good air compressor to run everything. Since this compressor will be your power source for all these tools, you’ll want to make sure you have the right type and size. What types of projects am I going to be doing? What types of air tools will I be using? What kind of power source do you have available? Occasional maintenance tasks or bigger construction projects? Automotive repair or home upgrades? Someone putting up a shed in their backyard will obviously need something more powerful than a hobbyist airbrushing some figurines. Some tools, particularly those that require constant air such as a sandblaster, will need an air compressor with a bigger tank and more airflow. To operate something like a brad nailer, almost any small compressor will do. Most air compressors can plug into a standard home outlet, but some larger compressors require a 240 volt source. A few others are powered by gasoline for when an electrical outlet simply isn’t available. Air compressors with large tanks can take up a lot of room, so if you have a smaller space to work with, you’ll want to be sure to find a compressor that will fit in the space you have. A 6-gallon pancake compressor will fit in almost any garage but a 30-gallon stationary unit may not. If most of your projects will be done in one place (like a garage or workshop), you won’t need to worry much about the design of your air compressor. However, if you plan to move your tools around frequently, you’ll want to look for an air compressor that is lightweight and easy to carry, or has wheels for better portability. 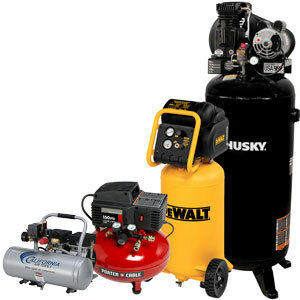 Once you have this information in mind, you’ll have a good idea of what size of air compressor is best for you. 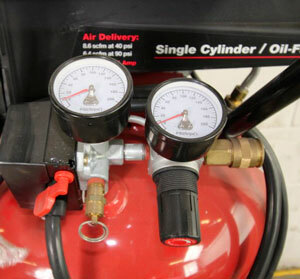 Air compressor tank sizes run anywhere from less than 1 gallon all the way to 60 gallons (or even more). The tank size simply determines how long air tools can run before the the motor in the compressor has to turn back on to create more compressed air. Because certain air tools (grinders, sanders, etc.) require a continuous flow of compressed air, they’ll need a larger tank than tools that operate in short bursts, such as brad and framing nailers. The less amount of times the motor has to cycle on and off, the better it is for its lifespan. If you were to trying to set up a large inflatable swimming pool with a 1-gallon compressor, the motor would be constantly running. Combined with its low airflow (see CFM Requirements below), you’d be lucky to be done in a couple hours. Now try the same thing with a 30-gallon compressor, and you’d be done in a few minutes. If going with a large stationary air compressor in your garage, you’ll definitely want to invest in mounting a quality air hose reel in a central location for ease of use and organization. The amount of airflow an air compressor produces is the most important rating you’ll want to pay attention to when shopping for a compressor. Noted as “Standard Cubic Feet per Minute (SCFM or CFM), this number will need to at least meet the minimum CFM rating of the air tool you’ll want to use. Since CFM changes depending on what you set the pressure (PSI) at on the compressor, us the “CFM at 90 PSI” rating of air compressors when comparing units. HP determines how powerful the air compressor’s motor is (to refill the tank). CFM determines how much power the air compressor provides to air tools. Every air tool has a recommended CFM requirement that’s set by the manufacturer. To determine what CFM rating you’ll need in an air compressor, take the highest CFM rating of your current air tools (or tools you plan on purchasing) and multiple that by 1.5. This will give you some wiggle room since CFM can vary a bit during operation, you may want to connect a couple air hoses to run multiple air tools at the same time (if your model allows it), or plan on upgrading air tools in the future. Here are some of the most common air tools and their average CFM requirements. Keep in mind that air tools are rated on a 25% duty cycle (in use for 15 seconds out of every 60 seconds) so for continuous use tools such as grinders, you may want to multiple the CFM number by 4.